Midfielder Michael Daragh Macauley is named in the number 14 jersey while Cian O’Sullivan given the nod at half back. DUBLIN BOSS PAT Gilroy has made two changes to the side which overcame the challenge of Wexford for this weekend’s Leinster football final. 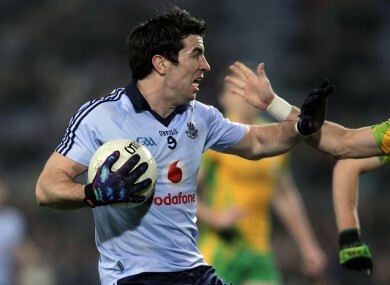 Diarmuid Connolly, red carded in that semi-final, is replaced by Michael Darragh Macauley. An all-star midfielder, Macauley has been named at full forward in the side where he is flanked by Bernard Brogan and Kevin McManamon. Gilroy’s second change was not enforced as he calls upon Cian O’Sullivan to line out at left half back in place of Ger Brennan. Dublin SF v Meath: Stephen Cluxton; Michael Fitzsimons, Rory O’Carroll, Philly McMahon; James McCarthy, Kevin Nolan, Cian O’Sullivan; Eamon Fennell, Denis Bastick; Paul Flynn, Alan Brogan, Bryan Cullen; Bernard Brogan, Michael Darragh Macauley, Kevin McManamon. Email “First XV: Dublin make two changes for Royals”. Feedback on “First XV: Dublin make two changes for Royals”.